There has been speculation on the blogosphere that an offensive against Israel could be iminent. Many view Syria as a likely aggressor. Syria would certainly like to reclaim her former territories in the highly strategic Golan Heights. Certainly Iran and Syria appear to working on unifying Israel's many enemies in the region. Iran and Syria in a joint communique issued here on Thursday evening invited the nations of Palestine, Iraq and Lebanon to unity. In the document, announced during the current visit of Iranian president to Syria, both sides expressed their satisfaction over bilateral excellent political relations and called for further broadening of relations in various fields notably in economic and technical affairs. The communique condemns the continued aggressive and oppressive acts of the Zionist regime. 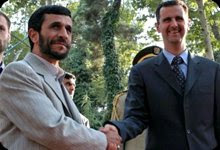 Iran underscored the rights of the Syrian people to restore occupied Golan hights up to the June 1967 borderline. Iran and Syria in their joint statement invited the Palestinian groups to dialogue and keeping national unity and supported the rights of the Palestinian nation for the return of the refugees to their motherland and establishment of an independent Palestinian state with Ghods city designated as its capital. The statement also condemned the continued sacrilegious and disrespectful behavior of the Zionists towards the historical sites aimed at obliterating their Arabic and Islamic identities and called for serious action by international circles to prevent such blatant acts of agression. On Iraq, both states expressed their support for the Iraqi government, its national unity, integrity and independence so as to bring about withdrawal of the occupying foreign forces and also preservation of its Islamic and Arabic identity. The statement also supports the efforts of the Iraqi government to realize national conciliation, and to foil seditious acts through national unity. On the situation of Lebanon, Iran and Syria underlined the need for strengthening national dialogue within the country and supported any agreement among the Lebanese which would guarantee its security, independence and prosperity. They also underlined their support for the rightful resistance of the Lebanese people against the Zionst agressions and restoring their occupied lands. They invited the related international bodies to take necessary measures in order to prevent daily incursions of the Zionists against the Lebanon's sovereignity. Iran and Syria in their joint communique invited the leader of the Muslim world to stand up and make joint efforts against the seditious actions against the Muslims. The Iranian president heading a ranking delegation arrived here Thursday evening for an official one-day visit and was welcomed by his Syrian counterpart Bashar Assad in the "Al-Shaab" Palace. Trevor, Iranians aren't Arabs, they're Persians. True, Blair and they speak Farsi, not Arabic. Have modified title accordingly. You should also look at a post from Once Upon a Time in the West as the blog author posted a strange message from an American living in Israel on the Free Republic forum of there being a large scale offensive by Palestinian terrorists. Both by Hamas and the "moderate" PLO as the Free Republic user describes what the West Bank (where the PLO controls it quite openly) is completely dessertted, along with its foot rationings gone.